Canoe Trail members Robert Wroth and Barry Small with John Tonkin College Year 8 students. After a slow start and a capsize, the group paddled up the Serpentine River into Goegrup Lake where they learned about the birdlife there and that dolphins had recently been rescued from nearby Black Lake. On the return trip, Canoe Trail Friends members Barry Small and Robert Wroth made regular stops to point out nests and birdlife as well as helping identify fringing trees and vegetation. Mr Wroth explained the impact global warming was having on the river system in relation to water temperature, water levels and fish stocks and it was of great interest to students who recently formed the new Estuary Guardians group to help protect and research the local dolphin population. 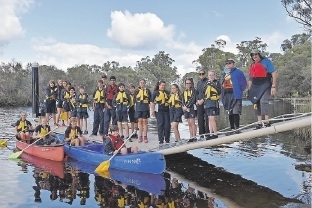 School staff members Geoff Hayes and Tiffany McLean said they looked forward to more paddles with the group and hoped the community would support the Peel Paddling Carnival. Mr Small said the paddle was like an extension of the recent Mandurah Dolphin Forum run by John Tonkin College students.